I’ve went through a somewhat irrational journey last month that started with me completely dismissing the sound quality of the Bose Soundlink Mobile Speaker II — and ended with me shelling out $349 for the premium/leather edition and even starting a Spotify Premium subscription. While my cognitive dissonance is still fading, I thought I’d share the journey in case there are others out there looking for similar audio solutions. It all started when a friend demoed his Bose SoundDock Portable in his appartment. That’s a relatively small sound dock for the iPhone, but it produced impressively rich sound quality. I already have a pretty sophisticated home cinema system in our living room that I’ve proudly owned for the last ten years, so I consider myself spoiled with very high fidelity audio at home. The only problem is that this system is limited to the living room. I don’t have any reasonable way of playing music anywhere else like the bedroom or in my office — other than cranking up the volume of the home cinema downstairs to insane levels. Seeing and hearing this SoundDock Portable system made me compelled by the basic idea of having a secondary sound system that I could use to enjoy music and radio when I wasn’t in the living room. Inspired by the SoundDock Portable, I started to look for an equivalent sound system that wasn’t tied to Apple’s proprietary standards but used Bluetooth instead. The two Bluetooth speakers that kept coming up everywhere in online reviews described as the “best” portable speakers were the Bose Soundlink II and the Jawbone BIG Jambox. I read countless of reviews and I really didn’t like that both of these systems seemed to be optimized for size and weight, rather than sound quality. These speakers are actually quite expensive when you consider the limited fidelity they output, but what you’re paying for is the portability factor — including built-in battery, microscopic footprint, and rugged durability. Well, I wasn’t really looking for that at all — I wouldn’t mind a slightly larger system that wasn’t as portable, but was still “carryable” so I could move it across different rooms in our house. The Samsung DA-E670. Better sound, but less portable. I then found systems like the Samsung DA-E670, which is in the same price range as the comparatively tiny Bluetooth speakers, but less portable and supposedly higher fidelity. However, the more I looked at those options, the more I started to actually like the idea of ultimate portability. My wife (who is surprisingly supportive when I have an urge to buy new gadgets — maybe because she knows that makes me more forgiving about her own shopping habits?) started to talk about how nice it would be to be able to bring a speaker like this with us on vacations. Also, there was something with the look of the Bose speaker that clicked with me on an emotional level already the first time I saw it — it reminds me of those old radios that people had in their garage or kitchen back in the days. So I decided to go to a store and test both the Soundlink II and the BIG Jambox — and I was immediately disappointed with both of them. Just like I had feared, they sounded great for their size, but ultimately nowhere near hifi quality. The salesman was quick to demo a larger machine that only supported Airplay (the Bose SoundLink Air) and it definitely sounded better but was out of question for me since I specifically wanted a Bluetooth speaker (Bluetooth is far more universal than Apple’s proprietary wifi solution and I have no plans to ever buy an iPhone). I got so upset about the fact that it was so hard to find something relatively portable that didn’t sound like crap and wasn’t coupled with Apple’s proprietary solutions that I had to post that rant about bluetooth speakers a month ago. But even after being disappointed with the Bose Soundlink II in the store, there was still this emotional urge left in me that made me want to give it another try at home. After all, the speaker probably would sound better at home than in the large store where I tried it. And besides, Bose offers you to try their products out at home for 30 days, so I figured I had nothing to lose. So I brought one home and tested it without all the noise in a busy store — and yes, the difference was definitely noticeable, it sounded better. What’s more, when placing it close to a wall in the bedroom and putting on some music at a moderate volume level, the sound quality was what I’d call good enough. I enjoyed discovering new and old music via a trial of Spotify Premium, and after over two hours of listening, the best testament of the sound quality is that I sometimes forgot that I was playing it from a TINY battery-powered bluetooth speaker! So let’s talk about sound quality. The soundstage is definitely limited/narrow, and just like many other reviews point out, it lacks a bit of clarity in the mids and treble. As I was experimenting with a trial of Spotify Premium for Android, I found that just increasing Spotify’s built-in 5-band equalizer to (0, 0, +1, +1, +1) made the sound just perfect for my taste. That said, I also noticed that the sound quality depends on the device you’re playing from too — if I stream audio from my MacBook Pro, the mids and treble sound clearer than when streaming from my Galaxy Note. Another thing I noticed is that the speaker sounds better if you step back a few meters and let it fill the whole room. If you stand too close to it (e.g. a meter or less), the stereo sound is rather narrow and directed — the sound feels more natural and wide/rich if you take a couple of steps back. The bass? It’s incredible considering the size of the speaker. If you place it up against a wall, it’s boomy all the way down to around (I’m guessing) 50 Hz, but below that there’s nothing — definitely no subwoofer magic hiding in this book-sized speaker here, but still impressively deep bass. For certain genres like classical music, this speaker can sound almost as good as my home cinema system (though with a much narrower stereo sound). As I was enjoying some scores by Hans Zimmer (Inception movie soundtrack), I even forgot that I was playing it from the same speaker that I completely dismissed when testing it in the store. If you listen to house or pop, it’s easier to tell that compromises had to be made in order to make the speaker this small — but it still sounds good. Waking up American style: radio and unhealthy but delicious food. Let’s get real though: although I was never able to actually test the Samsung DA-E670 and similar systems, I’m pretty sure that those sound better than the tiny portable speaker I ended up buying. It’s just that as I went through this research journey, I started to actually like the idea of being able to bring the speaker with me to more places than just between the bedroom and home office. Case in point: I wrote the bulk of this blog post from a hotel room in San Francisco while listening to Swedish podcasts, thousands of miles from home! Btw, for those interested in the differences between the BIG Jambox and the Bose Soundlink II, my impression in the store was that the Jambox had a more even/flat EQ curve, while the Bose had slightly weaker treble but richer bass. With richer, I don’t just mean louder — the Bose seems capable of reproducing lower frequencies than the Jambox (i.e. like the Bose gets down to 40 Hz and the Jambox only to something like 60 Hz). The Bose sounded slightly better in my ears. The thing to keep in mind is that the slight loss in treble/clarity of the Bose can be fixed with a small tweak of the EQ of your phone/tablet/computer, but you can never get the same deep bass back in the Jambox since the frequency range just isn’t there. So for me, the choice was very simple, especially since the Bose is also about ten times more attractive (in my very subjective opinion). 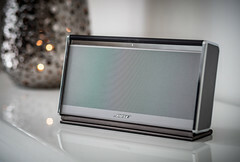 The bottom line is that there are two ways of describing the Bose Soundlink II: it’s either OUT OF THIS WORLD, if you consider the small size and design of the speaker — or it’s simply “good enough” as a secondary sound system in your house if you close your eyes and judge it based on sound quality alone. Given the added benefit of portability that this form factor enables and the remarkably sleek design, the Bose Soundlink II really deserves the highest marks. If you’re still not sure why you need this speaker, check out this awesome video that I found as I was downloading the internet to go through all reviews of it (yes, I’m still 100% a nerd in that sense). This entry was posted in general, music and tagged big jambox, bluetooth, bose, bose soundlink 2, bose soundlink ii, comparison, da-e670, jawbone, mobile, portable, radio, review, samsung, soundlink, speaker, spotify on 2013-03-02 by David Tenser.